Frequently Asked Questions Q: How does the technology work? A: In step one, particles entering the air purifier are electrically charged by the precision point ionization array using 22,000 volts DC to create dense ion “clouds” that attach to the particles. In step two, a specially designed media cartridge is sandwiched between 12,000 volts DC and electrical ground. A strong electrical field is created across the filter, which causes the negative and positive charges within each filter fiber to separate and migrate to opposite sides of the fiber (polarization). Particles entering the filter are electrically attracted to the oppositely charged part of a fiber resulting in extremely high collection efficiency. In step three, cell walls of captured pathogens are weakened or ruptured due to the electrical and environmental conditions inside the purifier, resulting in cell inactivation or death. Q: Why is germicidal capability important? A: Just capturing particles on an ordinary filter (like typical systems) doesn't eliminate all the risks associated with poor air quality. Dust, dead skin cells, and other matter collected on the filter provide nutrients on which trapped organisms can grow. The resulting waste products are carried downstream into the living space. Certain bacteria can release endotoxins to which many people are highly allergic. They can irritate the skin, induce respiratory problems, fever, and even cause shock. In humid environments, mold can multiply and actually grow through a filter and live spores can be distributed throughout the home. Q: Are Carrier ® air purifiers effective for the 2009 H1N1 Swine Flu virus? A: Product health benefit claims with respect to H1N1 Swine Flu are subject to the jurisdiction of the Food and Drug Administration. The FDA requires a Class II Medical Device certification for any air cleaning product publishing H1N1 Swine Flu claims. Carrier air purifiers are not certified as a Class II Medical Device. Infinity ® Air Purifier Performance™ Air Purifier Carrier® Systems for Unmatched Performance in Every Season Q: Do Carrier air purifiers make any sounds while operating? A: No. Unlike traditional electronic air cleaners, the air purifiers are silent and create no zapping noise. Q: How efficient are these units’ filtration? A: The Infinity ® air purifier is MERV 15. The Performance™ air purifier is MERV 13. The American Society of Heating, Refrigerating and Air Conditioning Engineers (ASHRAE) has established the Minimum Efficiency Reporting Value (MERV) so that various filters can be evaluated properly. MERV ratings are designated with numbers from 1 to 16. The higher the MERV rating, the better the filter's performance (percent efficiency) for smaller particles. A MERV rating of 15 requires 85-95% efficiency for the smallest particles tested. Q: How do I know when to change my filter? A: If your purifier is used in conjunction with the Carrier Infinity control, the control will notify you when it is time to change the filter. Other thermostats may have a timer or reminder built in. Check with your Carrier dealer to find out if your particular thermostat has a filter change reminder. If not, ask the dealer about a semi-annual or annual maintenance service. Willis Carrier’s meticulous attention to quality and detail led to a major culture shift in the way we live indoors. More than a century later, Carrier Corporation operates with a unique willingness to develop new technology, the confidence to revise proven designs and the ability to deliver results with every new installation. Part of that equation is our nationwide network of experts you can turn to for all of your indoor comfort needs. Your local Carrier dealer is well equipped to evaluate your home – everything from size, window placement, ductwork, venting and other structural specifics – and create a customized system designed around your lifestyle. So when it’s time to make a choice for your family’s comfort, make the best decision you’ll ever make – Carrier – and let the experts do the rest. Air Conditioner Gas Furnace Evaporator Coil Air Purifier Ventilator Humidifier Zoning UV Lamp Infinity Control The Total Indoor Comfort System Infinity ® Air Conditioner provides reliable, highefficiency cooling for long-lasting comfort and energy savings. Q: Are there any odor control benefits to the Carrier air purifiers? A: Carrier air purifiers are capable of capturing very small particles, down to 0.1 micron. Only odors associated with the presence of particulates will be reduced. If odor control is a concern, Carrier recommends installing a ventilator to bring in fresh air. 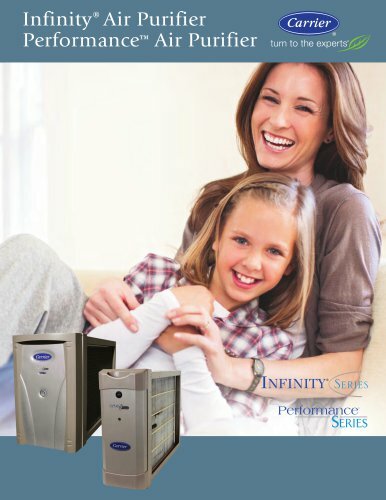 Infinity Gas Furnace provides reliable, highefficiency heating for long-lasting comfort and energy savings. Evaporator Coil is matched with the proper outdoor unit to provide top cooling efficiency and years of reliable service. Q: What is the power consumption of Carrier air purifiers? A: Approximately 18 watts. Air Purifier improves air quality by capturing and killing airborne bacteria and viruses and other irritating airborne pollutants in your home. Zoning sets different temperatures for up to eight different areas of your home for truly customized comfort and enhanced utility savings. Ventilator combines fresh outdoor air with conditioned indoor air for improved air quality and maximum efficiency – great for today’s tightly constructed home. UV Lamp inhibits the growth of contaminants on the indoor coil, leaving your home with cleaner, fresher indoor air. Humidifier replenishes moisture to dry air. Infinity Control is more than just a thermostat. It’s your interface to the Infinity System that allows you to control temperature, humidity, air quality, fan speed and ventilation. Models GAPA, PGAPA © Carrier Corporation 6/2012 Always look for these symbols. These are seals of certified performance, efficiency and capacity. A member of the United Technologies Corporation family. Stock Symbol UTX. Manufacturer reserves the right to discontinue, or change at any time, specifications or designs without notice or without incurring obligations.